Chez Dre is probably one of my favourite place for brunch in Melbourne, and a large part of that is due to their amazing array of desserts. 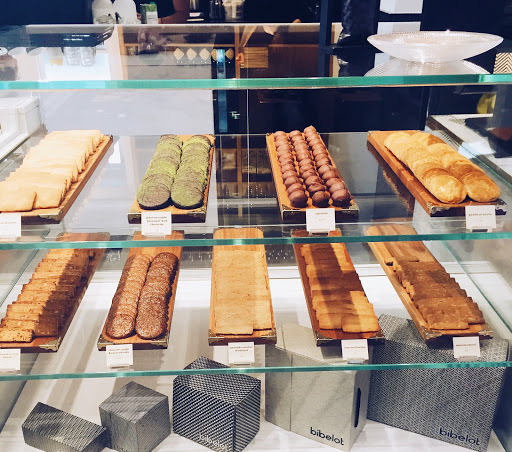 So when they opened up a dessert bar right next door, of course I marked it down as a place to visit. 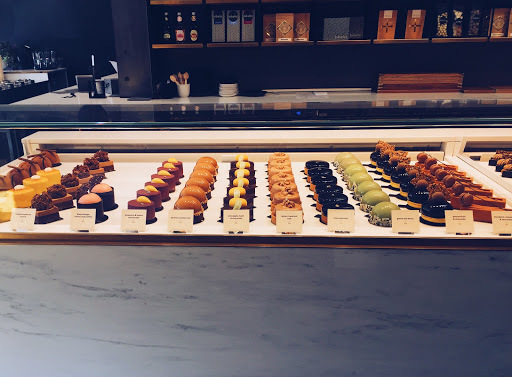 My friend from Japan came to Melbourne for her graduation, and because she has a sweet tooth, I decided to take her here for a promising afternoon treat. 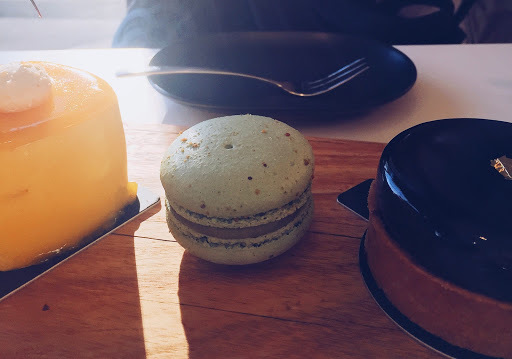 After ooh-ing and aah-ing for a good ten minutes at the glass cabinets, we finally settled on three petit gâteau and three macarons to share between the four of us. We started things off with a classic chocolate tart, although there was definitely an elegant twist in Bibelot’s interpretation. Beneath the shiny exterior, there was several chocolate textures, including some decadent chocolate ganache and chocolate mousse, and the tart base was made with almond sable, elevating it to the next level. The timeless combination of chocolate and almond was definitely a winner. 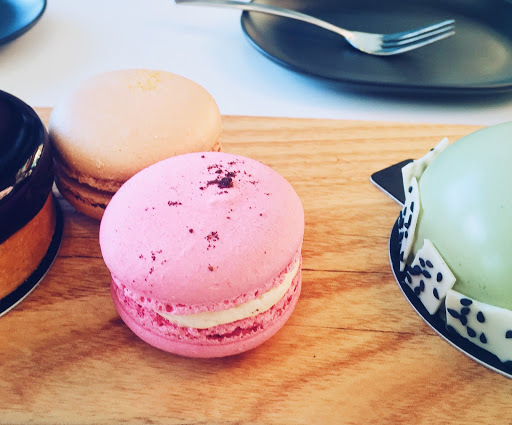 The well-loved salted caramel macaron was exactly what I expected, the pink salt giving a much needed relief to the rich caramel. 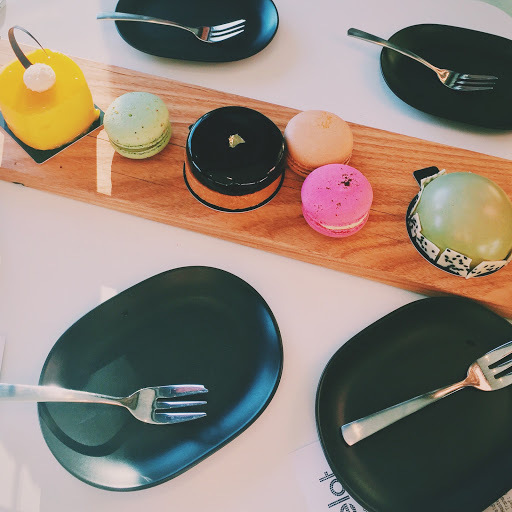 We went for a fruity and light macaron next, and it definitely ranks as one of the best macarons in Melbourne for me. The lightness of the outer shell contracted beautifully with the creaminess of the chestnut-vanilla creme, although the chestnut flavour was quite hidden. Next up we picked pistachio, because you can never go wrong with pistachio. 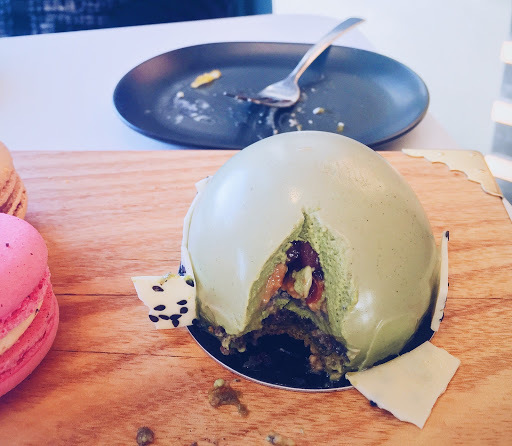 The pistachio flavour definitely came through a lot stronger than the chestnut. The mango, yuzu and coconut was probably my pick of the day. 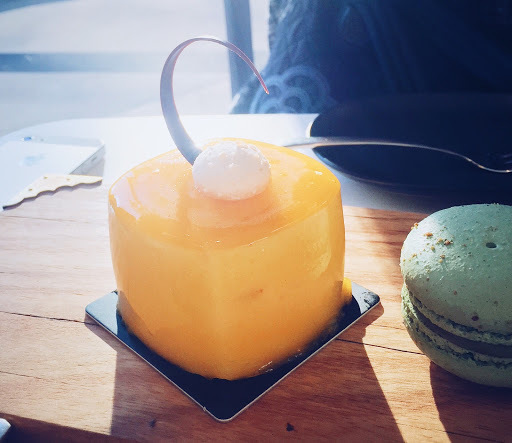 The citrus note from the yuzu was quite intense, but along with the mango and coconut mousse, the flavours were balanced out nicely. 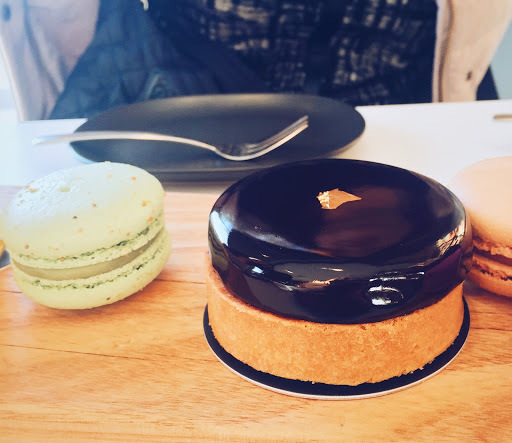 The different textures of mousse, tuile, jelly, dacquoise, and cremeux sounds way too complicated on paper, but they all complimented each other very well. 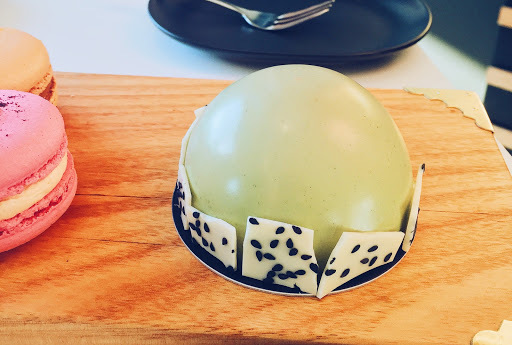 We picked a green tea option just to pay homage to my friend’s Japanese roots, and this is probably the epitome of Asian dessert, combining green tea, black sesame, and adzuki beans. Inside the dome made with muscavado creme, which was actually a bit denser than I expected, there was layers of adzuki beans, black sesame brulee, more muscavado creme, and green tea chiffon at the bottom. The flavours worked well together, and again, the complexity of the textures was what sold it for me. We each had a different favourite cake in mind when we left, which just goes to show how perfect each and everyone of those desserts are, it really depends on what kind of flavours you like. 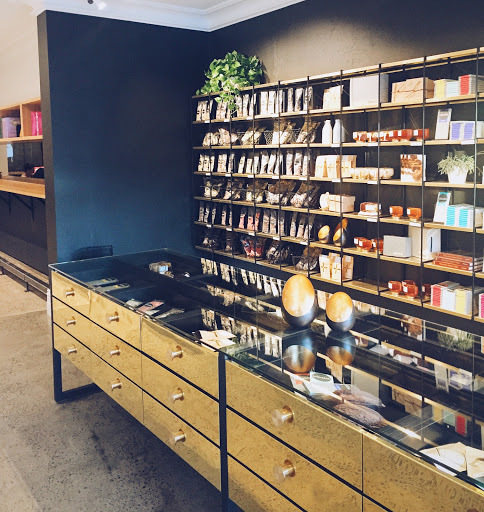 There was a range of chocolate goods that you can bring home with you, or purchase as a gift. Visiting Bibelot definitely reminded me of why I love Chez Dre so much, and a return is much needed! 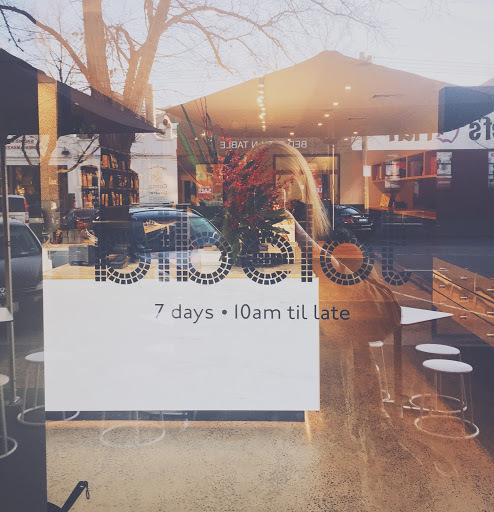 Bibelot is located on Coventry Street, take tram #1 and get off at Stop #25 – Cecil St/Park St, and it’s a five to ten minutes walk away.